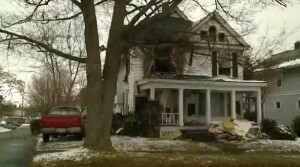 ASHLAND, OH — A woman is crediting God for putting her in the right place at the right time to save an elderly man who was unable to escape his house as it caught fire in the middle of the night. This past Sunday, 32-year-old Shannon Marshall was headed for the store to get popsicles during her 3 a.m. work break. However, as Marshall was driving, she noticed that there were flames shooting out of a house in front of her. She called 911 for help, but worried whether anyone was inside. Marshall walked up to the door and noticed that it was open. “That’s when I heard him yelling ‘Help!” she explained to News8 Cleveland. When Marshall entered the house, she saw an elderly man lying at the top of the stairs, who was unable to walk down the steps. Marshall pulled the elderly man outside to safety—and she believes just in time as he was completely black and blistered. Just as she exited the house with the man, firefighters began to arrive. The man was transported to a local hospital, which transported him to a second hospital via helicopter. The Ashland Police Department now states that it would like to honor Marshall for helping to save the man’s life. But Marshall says that she believes the Lord used her to help rescue the elderly man. A dog belonging to the gentleman was also located later in the day and is temporarily staying at the fire department. The cause of the fire has not yet been identified, although firefighters did note that a number of space heaters were found in the rubble.